The Letran Knights are the men's varsity teams of the Colegio de San Juan de Letran that participate in the NCAA (Philippines). The women's varsity teams are the Letran Lady Knights, while the High School varsity teams are called the Letran Squires. When Letran College joined the NCAA (Philippines) league in the 1928–29 season, it took the knight as its mascot. The Knight was chosen as the school mascot since its founder, the Spanish officer Don Juan Geromino Guerrero, was a Knight of Malta. Letran College was an active participant in inter-collegiate basketball throughout the twentieth century, and continues its activity into the 2000s. Letran College won the La Liga Catolica (The Catholic League) in the early 1920s. When Letran joined the NCAA (Philippines) in 1928, the Squires promptly won the junior's championship in their first season and went on to establish the then NCAA (Philippines) record of three consecutive junior's championships. Letran College withdrew, however, in 1932, after a dispute over an ineligible player in the track and field athletics league. Letran College later rejoined the league in 1936. Two years later, the Knights won their first senior basketball title under coach Jacinto Ciria Cruz and team captain Felicismo Fajardo. The other members of the victorious 1938 quintet were Angel de Leon, who later coached the 1950 Letran team that won the NCAA title, Guillermo Salvador, Feliciano Manlulu, Carlos Camillas, Jose Pacheco, Honesto Baltazar, Francisco Nepomuceno, Victorio Salazar, German Monzon and Guillermo Mendoza. The seasons following this were disappointing for the Letran Knights, until the team achieved a breakthrough in 1950. The Knights emerged as the top team in the 1950 season. Winning the first five games, the Knights were assured of a place in the finals since winners of the first and second rounds were automatically given a spot in the championship. They went on to win the next four second-round games as well. It was determined that there was no need to hold a championship round and they won by default. The team was headed by 1948 Olympian Lauro "The Fox" Mumar, nicknamed "Murder Inc."
During this period, the Knights made a habit of winning championships around the turn of every decade. In 1960 led by Clemente Vargas and then rookie Freddie Webb they beat the Jose Rizal Heavy Bombers in the championship round. 6 years later in 1966, the Knights beat the Heavybombers again for the championship. In the 1970 season, the Knights, led by Molet and Ricky Pineda, Rudy Hines and Dave Regullano among others, beat De La Salle University, Manila, for the championship. In 1979, two sides from the Intramuros district of Manila, the oldest part of the city, battled one another in the championship round of the tournament. This 'Battle of Intramuros' saw the Letran Knights and the Mapua Cardinals face off for the championship. Coached by the legendary Nemie Villegas, and led by Most Valuable Player (MVP) Ramon San Juan, shooting forward Angelito "Itoy" Esguerra, spitfire Pedrito "Bong" Aninon, Timoteo "Tim" Coloso, Nonito "Nonie" Robles, and team captain Ed Baldomero, the Knights defeated the Leo Isaac-led Cardinals to take home the school's 6th championship. The 1980 season changed the face of the league and led to the future segregation of supporters. Fans of the Letran Knights, hoping for a back-to-back winning season, and the fans of the De La Salle Green Archers, got involved in a large brawl inside the Rizal Memorial Sports Complex. The well known story of the brawl was it started when one of Danding Cojuangco's "goons" attacked a Letran high school student during the game. The BAP ordered the game to be re-played but the NCAA (Philippines) Policy Board decided to cancel the whole tournament. Letran was suspended in 1981 because of its participation in the brawl and got reinstated the year after but La Salle was not in favor of it and decided to leave the league for good. They would later join the University Athletic Association of the Philippines in the 1986 season. Following the troublesome 1980 season with suspension from the league and a victory for the Mapua Cardinals, the Letran Knights started the 1982 season under the tutelage of new coach Coach Larry Albano which featured a very exciting player named Samboy Lim. Samboy Lim is a graduate of San Beda High School and also played for the San Beda Red Cubs (the Juniors Basketball team of San Beda). After sweeping the first round, the Knights continued to pile up victories in the second round and was two wins ahead of #2 ranked San Sebastian. The Knights were unofficially crowned champions but they still had to play Trinity College in a no-bearing game to officially finish their NCAA campaign. The Knights lost that game 102-89 but it didn't matter as the school's 7th trophy was still presented to them. In 1983, the heavily favored Samboy Lim and the Knights advanced to the championship round where they will meet Nani Demegillo and the San Sebastian Stags for the title. The championship game was decided on a best-of-3 series and both teams split the first two games but in Game 3 the Knights played inspired basketball due to Samboy Lim's heroic deed of choosing to play instead of resting in the hospital (he suffered an asthma attack in Game 2 and has to be sent in the hospital that night) and captured their 2nd straight championship. Romy Ang was named MVP of the season but Samboy Lim's heroics left an indelible impression to the hearts of those who witnessed it. With San Beda taking a leave of absence in 1984, the NCAA kicked off the season with only 5 schools participating but it didn't distract the Knights as they secured a date with history as the become the first school to finish the season undefeated and champions. Samboy Lim was named MVP of the season and RP Team patron Danding Cojuangco gave him a spot on the National Team roster. In 1987, the Letran Knights now coached by Eddie Reyes went back to the championship to face the defending champions San Sebastian Stags. The Knights had a good mix of veterans and rookies led by Dong Libed, Tano Salazar, Justino Pinat, Art Ayson, Jing Ruiz and Robert "Lakay" Ruiz to name a few. San Sebastian had Paul Alvarez, Eugene Quilban, Chris Bade, Melchor Teves and their coach is Francis Rodriguez. The championship was decided on a best-of-3 series and after both teams split the first two games, Game 3 will prove to be a cardiac game as Dong Libed scored the game winning shot as time expires to give the Knights their 4th championship of the decade and breaking the hearts of the defending champs. One highlight of the 1987 season was the awarding of the MVP trophy. The award was given to Alvin Patrimonio of Mapua but many NCAA fans including the Letran faithfuls felt Patrimonio didn't deserve it as they felt Dong Libed was the more deserving as he not only played his best season but he was the force behind Letran's rise to the top. The fans also that time felt Nap Gutierrez (Mapua's team manager, future agent of Patrimonio and showbiz agent as well) had something to do with it. A rematch was inevitable in 1987 the Knights relied on the lucky hands of Dong Libed as he scored another game winning fadeaway shot over two defenders to win their 5th championship of the decade. Art Ayson was named MVP. During the 1999 season, the Letran Knights were mentored by Binky Favis, who later coached the Coca Cola Tigers. History was made when the Letran Knights became the first team ranked fourth to beat a number one ranked team, the San Sebastian Stags, in the semi-finals that year. In 1999, the Stags attempted to win their sixth consecutive title, but the Letran Knights, helped by Kerby Raymundo and Chris Calaguio, and coached by Louie Alas, denied them this honor and took the championship for themselves after 12 years. From the 2000 to 2002 seasons, the Letran Knights struggled as they underwent a rebuilding process, failing to become one of the top four teams in the competition for three consecutive years. The 2003 series culminated with a play-off between the Letran Knights and the hosts, the San Sebastian Stags, who had won the previous two championships. The Knights, coached by Louie Alas and led by Ronjay Enrile, were aiming to break Ateneo de Manila University's record of 14 titles. The series reached a deciding third game. In the final minutes, Boyet Bautista, Aaron Aban and Jonathan Piñera ignited an 8–0 run, turning a 56–58 deficit into a 64–58 title-clinching victory. Ronjay Enrile was voted as NCAA (Philippines) Finals MVP. As a result of this success, Letran College joined the Philippine Basketball League (PBL) in 2003 under the banner of Toyota Otis. The Knights captured the third-place trophy in the Unity Cup after beating the defending champions Hapee Toothpaste. Emerging at the end of the elimination round during the NCAA (Philippines) 2004 season with a 9–5 standing, the Letran Knights faced, in the Final Four tournament, a Philippine Christian University Dolphins side who had a 10–4 standing, giving the Knights a 2 to 1 disadvantage. The match was forced to a deciding game, but Enrile missed both of his free throws in the 4th quarter and the Dolphins won. The Dolphins went on to win their first NCAA (Philippines) title against the season host, UPHSD Altas. Progress in the PBL was also a disappointment for the Letran Knights that year. With Letran College hosting the 2005 season, the Letran Knights and the PCU Dolphins were considered certain to be finalists. In the first round, the Knights defeated the Dolphins in overtime. The Knights and the Dolphins finished 1–2 at the end of the eliminations. They each disposed of their semi-final opponents to set up one of the most widely anticipated finals in recent history. The Dolphins shocked Letran College as they emerged as winners in game one. The Knights, however, won game two, led by J P Alcaraz. 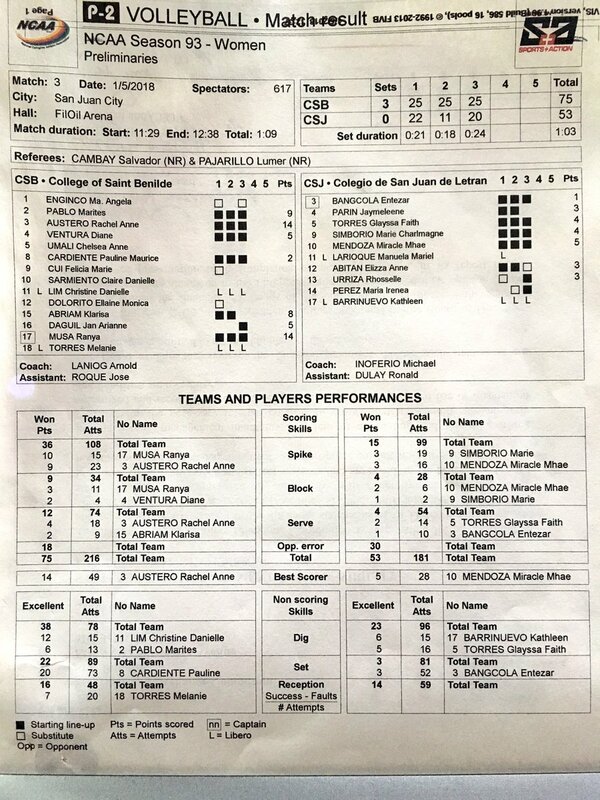 The deciding game was won by the Knights, with Boyet Bautista winning MVP honors. Louie Alas won his third NCAA title and was awarded Coach of the Year. In the Philippine Basketball League (PBL) Heroes Cup that followed, the Letran team Toyota-Otis drafted former University of Texas-El Paso player Joe Devance, but the Knights finished last in their division. In the PBL Unity Cup of that year, the Toyota-Otis team, now known as the Sparks, beat defending champions Rain or Shine Elasto Painters in a best-of-five series, setting up a best-of-five final game against the Harbour Centre Portmasters. Aaron Aban received a wrist injury which put him out of Games 4 and 5 and the Portmasters defeated the Sparks. Devance was named MVP of the tournament. In the 2006 NCAA (Philippines) season, the Knights had a 6-0 start but were beaten by San Beda in the first round finale. The Knights won several more games, but with losses to eventual semifinalists Mapua, PCU, and San Beda in their last three elimination round games, they were forced to face-off with PCU. The Knights lost this game and went on to lose another in the final four, finishing second runner-up. Letran Knight Boyet Bautista won the Most Improved Player award. Louie Alas described the 2007 season as a "rebuilding" season,[attribution needed] with Boyet Bautista and Aaron Aban leaving the team after being drafted into the Philippine Basketball Association. The Philippine Christian University Dolphins were suspended, leaving only 7 teams in the competition. The Letran Knights won their first four games before losing to the hosts, the JRU Heavy Bombers. They went on to defeat the San Beda Red Lions, who until then had been unbeaten, and so finished on top after the first round. The team was beaten by Mapua and San Beda in the second round, but still finished second. They defeated the Heavy Bombers in the semifinals but lost to their old rivals the San Beda Red Lions in the Finals. In 2008 season, Letran won the first six games of the season, including a come-from-behind win against UPHSD, but faltered in the first round finale against San Beda. In the elimination round finale, Letran was on the verge of winning a twice-to-beat advantage but a game went into overtime. In the extra period, Letran was leading by 4 points when San Beda rallied to lead by two. RJ Jazul scored on a driving lay-up with 5 seconds remaining but Borgie Hermida scored a buzzer-beater with a looper from the free-throw line to seal San Beda's third straight semifinal appearance with the twice to beat advantage. After San Beda's win against Letran, four teams, including the Knights, were tied from 2nd to 5th, with only 4 teams advancing to the semifinals. Letran defeated Mapua, 62-52, in the classification round and managed to qualify for the second-seed playoff game against JRU. But JRU defeated Letran and the former clinched the second-seed and twice-to-beat advantage. The two teams meet again in the semi-finals, but still Letran lost. In 2009, the Knights were still lead by RJ Jazul and Rey Guevarra, who were on their final year of eligibility. Joining them was the former Letran Squire star, Kevin Alas. On their last elimination game, San Beda had an easy win against Letran, but not before Rey Guevarra was injured after a bad fall in a collision with San Beda's Sudan Daniel. Guevarra would be ruled out for the rest of the season with an anterior cruciate ligament (ACL) injury. Letran garnered a fourth-place finish and allowing themselves to qualify in the Final four where they faced, and still lost, to San Beda. 2010 was a forgetful season as the Knights failed to advance to the Final 4 for the second time in the Louie Alas era but 2 weeks after the Final 4 they started their preparation for Season 87. 2011 was indeed a good season to look forward to for the Knights as it not only saw the vast improvements of Kevin Alas, Raymond Almazan, Jojo Belorio and VJ Espiritu but they also added rookies Kevin Racal, JRU transferees Joel Gabriel and Carlo Lituania and spitfire point guard Mark Cruz and Zyon Cudal from the Letran Squires program. From 5th place the previous year, the Knights cruised to the Final 4 as the #3 seed and faced the #2 seed San Sebastian Stags. They beat the Stags in the first game to force a do-or-die game but eventually lost in the second game. Kevin Alas and Raymond Almazan were named to the Mythical 5 and Almazan also bagged the Defensive Player of the Year award. 2012 was a roller coaster ride for the Knights as they start the season seeing themselves sinking down as far as the 6th spot and it didn't stop there as star center Raymond Almazan was missing a lot of games in the first round due to unknown reasons. Almazan vowed to come back in the 2nd round and with him back in the lineup, the Knights became the hottest team in the NCAA as they won 7 of their 9 games just enough to secure the #3 spot to force a Final 4 rematch against San Sebastian. In the first game Kevin Alas made history as he scored 43 points (the most in Final 4 history)to force a knockout game. In the do-or-die game, the game went down to the wire just like the previous year but Jojo Belorio made sure it will be Letran this time by scoring the game winning free throws to book the last ticket to the Finals. They met their archrivals, San Beda in the finals. Although they avoided defeat by winning the second game after losing the first game, they were blown out in the last game of the finals by the Red Lions. This season, the battlecry W17NESS LETRAN was formulated for their bid to attain the school's 17th overall title in the men's basketball tournament. 2015 was an excellent year for the new generation and young blooded Knights as they were able to snag back the crown to the walls of Muralla and end a decade-long title drought. Despite having a small lineup and a new coach, they were able to surprise the league, defeating bigger teams and also upsetting the Final Four teams of 2014. Ultimately, the Letran Knights were able to defeat the reigning champions San Beda Red Lions. But this achievement was not easy as the latter came back with a kick in the Fourth Quarter to force the deciding game of the Finals into extra minutes. Despite the pressure and the lack of experience in crunch time situations, the gallant Knights of Muralla, along with their talents and hearts, showed who really wanted to bag the title and beat the Mendiola-based squad with the score of 85-82, denying them of a 6-peat championship and ending their 5-year dynasty. Mark Cruz was the MVP of the game. The battlecry W17NESS LETRAN was still held and achieved in this season. Tonichi Pujante - Member of 1982-1984 NCAA Champion Team, first Commissioner of Vietnam Basketball Association. 12 ABITAN, Eliza Anne D.
14 PEREZ, Maria Irenea A. 1 TUMBALI, Frobel Evander G.
7 ORSINI, Leonardo III B. 11 BRIOSO, Vincent Philip B. 14 SISON, Zecharia Jan V.
15 LADEON, Perpitou Jr. C.
19 RAMOS, Denn Abdiel M.
– member of the Philippine National Team who has won a lot of most valuable player awards, and Best Attacker and Best Scorer in both the NCAA (Philippines) league & Shakey's V - League. – sister of Michelle Carolino, member of the Philippine National Team who has won a lot of MVP awards, as well as Best Attacker and Best Scorer in both the NCAA (Philippines) league & Shakey's V - League. Letran College had organized its own football team in 1911, known as the Letran Athletic Association. The team, nicknamed 'The Bohemians', won the national championship in the years up to 1917. Then, it joined the La Liga Catholica where it competed against other Catholic schools. The Letran Booters joined the NCAA (Philippines) in 1932. The Letran Booters won several titles in the NCAA (Philippines), most notably during the 1980s, when they beat a favored Mapua team with Taiwanese and foreign-bred players. However, due to financial restraints, Letran College discontinued the seniors football program in 2003. ^ Gacusana, N.P. (September 2005). "15 years of being on top; Knights bring back the glory to Muralla". The Lance. Archived from the original on 2011-07-16. Retrieved 2011-02-14. ^ Fernandez, R.V. (November 8, 2016). "Commissioner of Vietnam pro league is former Letran Knights star Tonichi Pujante". Spin.ph. Retrieved 2018-11-05. ^ a b Escarlote, Mark (December 27, 2017). "LOOK: NCAA Season 93 team rosters". ABS-CBN Sports. Retrieved December 29, 2017. ^ Escarlote, Mark (January 5, 2018). "#NCAASeason93 volleyball (W): CSB def. Letran". ABS-CBN Sports. Retrieved January 5, 2018. ^ Escarlote, Mark (January 11, 2018). 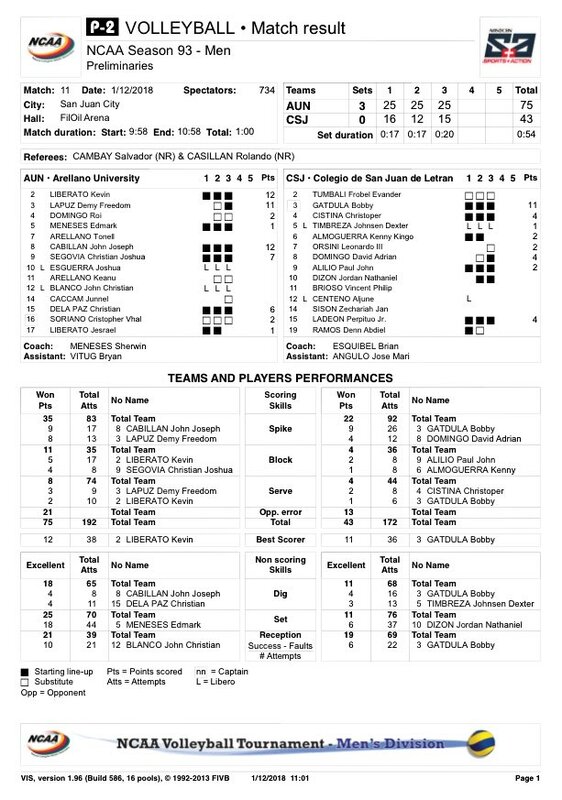 "#NCAASeason93 volleyball (W): Arellano vs. Letran". ABS-CBN Sports. Retrieved January 18, 2018. Wikimedia Commons has media related to Letran Knights.